With regulation heavy rock attire, packing some serious sonic firepower and not cracking a smile, the five members of Dovey looked like they meant business from the get-go. And wow, did they. 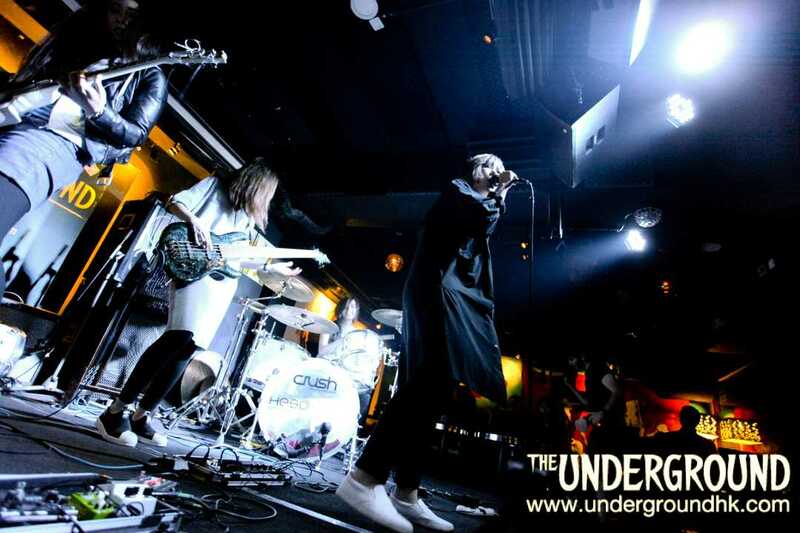 A huge, buzz saw twin-guitar attack from six-string sirens Ami and Kay and soaring, impassioned vocal from cute bob-haired Sogun made for a massive sound which alternatively pulverised and beguiled a transfixed audience into submission. Not to be left out, bass player Ting was great, funking and twanging to hold the bottom end together while drummer Renee was also a total star, belying her demure appearance by rocking like a drumming dervish. She also looked like she had just walked off the set of a TVB historical drama. Yum. After singing the first track partially in English, Sogun announced (in Cantonese) – “we are from Hong Kong, now we sing in Cantonese!” to great applause. To be honest they could have been singing in Serbo-Croat – the language of rock is universal, kids. Effortlessly maintaining the drama, this was a really excellent performance from an experienced band with more than 100 gigs under their studded musical belts. My only criticism was that with just five tracks, it felt like a short set. Just as I was getting into it! But you know what they say – leave ‘em wanting more. And I’m sure I wasn’t the only one in the audience who could have done with another couple of Dovey doses (does that work?). A classic Hong Kong rock sound, combined with great looks and strong commercial appeal made Dovey the act of the night for me. Lovey Dovey! I have to say, their first number, although an excellent song, sounded very disjointed, but that’s understandable, it’s the warm up song. And after the second & third number, I felt like more rehearsal time was in order as, again, they sounded quite disjointed and lacked cohesion. I like their guitar riffs and the melodies of their music, but they’re out of sync at times, which is quite distracting. I wonder if it’s to do with the new drummer?? Don’t get me wrong, I really like their music. Their fifth song is an English one which my Scottish friend “K” says is “reminiscent of THE SLITS in the 80’s but with more guitars, and more rockier than the reggae stuff THE SLITS used to play.” So there. Dovey is a band with a large sound that rocked the house! I guess I’m just a perfectionist. I think they can do even better! Dovey was a bit nervous, that was easy to spot. This all girl band impressed us with professionalism in playing, but they seem to fear looking at the audience or even communicating with them/us. They made very mature music. I had to assume majority of the bands in The Underground already produced mature music, but when you watched their young stage performance, the music was exceptionally mature. Mild-looking lead guitarist Micky could actually lead the sound of the band through her tasteful guitar licks, and when she broke into the finger taps it was a pity the crowd did not go wild, may be because she was being so nonchalant about it that everyone else thought it was “oh nothing, never mind”. Their songs typically had a hard-rock arrangement, just sounding rather pop-rock. This highlighted singer Natalia’s great voice, reminding me of Dolores O’Riodan of The Cranberries. And we all know, this kind of voice can go very far. With this amazing line up, why so shy?